Discussions between Iran and members of the UN Security Council begun again. Is there any indication things will change this time around? The next round of talks between Iran and the permanent members of the UN Security Council plus Germany, the "P5+1" was held on April 14 in Istanbul. The parties are publicly formuled their negotiating positions. "Iran must fulfill its international obligations, including the complete suspension of uranium enrichment as per multiple UN Security Council resolutions," said White House Press Secretary Jay Carney. He continued: "The regime in Tehran must take the verifiable decision to forgo pursuit of a nuclear weapon." U.S. Secretary of State Hillary Clinton has already outlined the steps that Iran could take to prove the peaceful nature of its nuclear program. These include removing all highly enriched uranium from the country, halting enrichment above the level of 20%, and opening up its nuclear facilities to the IAEA for inspection. Moscow’s view is similar, but not identical. Last week Russian foreign minister Sergei Lavrov stated that the approach adopted by the P5+1 several years ago implies that as soon as Iran convinces all parties of its exclusively peaceful intentions through IAEA verification, it will be vested with all the rights of a nuclear member of the IAEA. He added that in such case all sanctions on Iran should be lifted. Naturally, Moscow is opposed to Iran becoming a nuclear power and would like to see proof that it is not seeking to do so. However, it acknowledges Iran's right to conduct nuclear research in accordance with IAEA rules. In this context, enrichment could be carried out under the supervision of international inspectors. 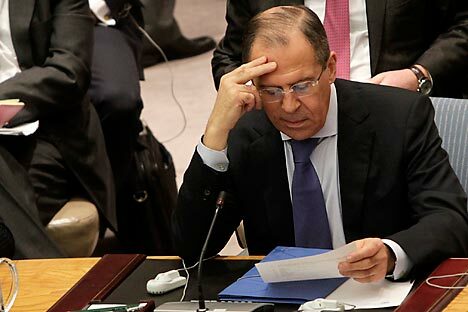 But Moscow has made clear its view that sanctions on Iran have been exhausted, and that any potential strike against Iran would be blocked by the UN Security Council. Its position is shared by Beijing. Meanwhile, Tehran has announced its terms of compromise. In the words of Fereydoon Abbasi, director of Iran's Atomic Energy Organization, Tehran may halt uranium enrichment at 20 percent after it accumulates sufficient fuel for its nuclear reactors. "As soon as we obtain the amount of fuel we need, we will stop producing it and may even start enriching only to a level of 3.5 percent," Abbasi said. At the same time, he stressed that the West's demand for an immediate halt to all uranium enrichment was out of the question. It should be kept in mind that over the years Iran has acquired around 2,000 tons of 20 percent enriched uranium from Argentina. This uranium was used both for research purposes and for radiation therapy (the country has roughly 800,000 cancer patients). Iran's position is laid out in further detail in an article for the Boston Globe by Hussein Mousavian, Tehran's former chief negotiator in nuclear matters. In Mousavian’s opinion, a breakthrough in the nine-year talks can only be achieved by acknowledging Iran's "lawful right to a nuclear program" and waiving the demand for a suspension of uranium enrichment. For their part, the "mediators" should receive an absolute guarantee that Iran is not pursuing a nuclear weapon and an opportunity to "clarify ambiguities in its nuclear program in accordance with the requirements of the International Atomic Energy Agency." "It is already too late to demand that Iran cease its enrichment program," writes Mousavian, "because it mastered the technology and reached breakout capability in 2002, and continues to improve its work in this field." Given that Mousavian has also stated that sanctions against Tehran and attempts to change the regime should be stopped, it can be assumed that this article in an influential American newspaper was not the impromptu act of a retired diplomat. By recognizing Iran's right to enrich uranium in exchange for wider inspections, the six-nation group could reach a compromise. But to achieve this will require more than just another round of talks. "The meeting has been preceded by an unprecedented flaring of tempers, and clearly the first task is for all sides to cool off. Obama is obviously keen to avert another war. Tehran, too, has no interest in further aggravating the standoff," said Gennady Evstafiev, a veteran of Russian's Foreign Intelligence Service, with knowledge of the problems of non-proliferation. "The summit in Istanbul shown a positive result."